Haven’t decided on a hotel yet? You can look at other available hotels in the Hesse region with Booking.com. Modern Hessians are said to be descended from the Germanic Chatti, a tribe who settled near the Fulda River before the arrival of Christianity. 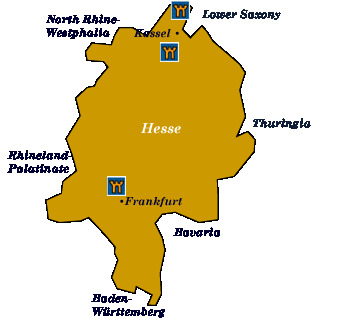 Hesse (Hessen) sailed through history as an assortment of small princely (landgrave) states. Hesse’s greatest ruler, Philip the Magnanimous briefly united the territories in the 16th century, but the state split apart after his death. Even after German unification under Bismarck in the 19th century, the region remained a series of administrative districts until unified once and for all as a state of the new Germany after World War II. With so much princely blood and contention in the area, it’s no surprise that a multitude of castles exist on every hillside, with many reincarnated as magnificent castle hotels. Hesse is also the land of the Grimm Brothers. If you’re well read in the fairy tale genre, you’ll know that any Grimm Brothers setting has to have a proper castle and a dark, enchanted forest filled with fairies, ogres, wizards, and an occasional big bad wolf. Hesse won’t disappoint. Fast forward to the 21st century, and on a serious note...Wiesbaden, an attractive spa town is the state’s capital, but nearby Frankfurt-am-Main attracts attention for its importance as Germany’s financial capital. Most travelers seem to pass through Frankfurt at one time or another because of its importance as a transportation hub. The Fairy Tale Road (Deutsche Märchenstrasse) Of all the different “themed” roads the German Tourist Office promotes, the “Fairy Tale Road” is the most romantic. Beginning in Hanau and ending at the North Sea, the road meanders 600 km across four states—Hesse, Lower Saxony, North Rhine-Westphalia, and Bremen. Along the way, the folk traditions and fairy tales of the Grimm Brothers, (who lived, fittingly, for some time in their mother’s native city of Kassel), are highlighted. The rural landscape remains timeless and noncommercialized. Castles rise from the mist, while wisps of smoke curl upward from half-timbered, gingerbread villages. Pure fantasy! A couple highlights along the way: Steinau is an utterly charming little village of half-timbered houses, cobblestone streets, and a small castle, which was converted into a Renaissance palace. The village of Lauterbach is famous for its garden gnome industry, in which over 60,000 are produced every year. Alsfeld is a worthy visit for its exceptional Rathaus (town hall), which has an unusually steep slate roof with two towers that resemble witches’s hats. Marburg is a pleasant university town with a charming Altstadt and 13th-century Gothic cathedral. Although a modern city, Frankfurt has a number of worthwhile sights. The Römerberg, or medieval town square, is the heart of the city. One structure that survived World War II is the Kaiserdom, where the Holy Roman Emperors of the 16-18th centuries were crowned. Museums of note are the Goethe-Haus, birthplace of the famous German writer Johann Wolfgang von Goethe; the Städtische Galerie Liebighaus, with its famous collection of medieval, classical, and Renaissance sculpture; and the Städelsches Kunstinstitut und Stadtische Galerie with a fine collection of French impressionist and Flemish art.